There are two main reasons why news sites are reluctant to send readers away by linking to third-party content. First, you shouldn’t send people away or else they won’t come back to your site. Second, a page with links that sends people away has low engagement, which doesn’t serve advertisers well. But if you actually look at the data, both of these assumptions are completely wrong. What do you notice about the top site on both lists? First, the top site has twice as many sessions per person. Second, the top site has nearly twice as much time spent per person. So users of this site find it indispensible, and they are highly engaged. But the most important difference between the top site and all the other sites, is that this top site — Drudge — has nothing but LINKS. That’s right folks. Drudge beats every original content news site by a two to one margin. Drudge is also one of the largest news sites that isn’t built on an offline brand or a communications portal. Still thinks sending people away with links is not a good strategy online? Ask Google. They do pretty well. Oh, and here’s a dirty little secret of sites like NYTimes.com — you would think their high quality, in-depth content would yield engagement numbers that could beat Drudge. But these metrics are averages of all site visitors, and the averages of the original content sites are being dragged down because many of the unique visitors come from sites like… Drudge and Google — and those visitors are not devoted users. Drudge, on the other hand, is probably close to 100% devoted users. What kind of users do you want your site to have? 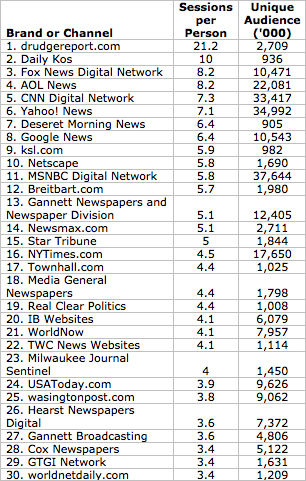 And here’s another dirty little secret — Drudge is one of (if not the) largest referrer of traffic to most of the newspapers on these lists. But all of these sites are content (pun intended) just to chase traffic from Drudge. Assuming 60% sell-through at $4 CPM… that’s $56 million annual revenue. Why was it again that your news site doesn’t link out? Drudge’s session numbers are worthless. Unlike every site on the list, Drudge has an artificially high auto-refresh rate of something under 3 minutes, I think it might even be as low as 2 minutes. The conclusions are fairly obvious– every person who leaves Drudge’s page open in a new tab, or leaves their desk for lunch created dozens or even hundreds of “new” sessions. I find it ironic that most of these commenters came here from Techmeme, a site that has nothing but links and that auto-refreshes. Techmeme, like Drudge, is INDISPENSIBLE for its users, something any news site should want to claim. And Techmeme has found the key to unlokcing value for advertisiers (hint: it’s not display ads) — sponsorships in the form of content links, just like Techeme’s editorial content. And really, what news site wouldn’t want to be open in a reader’s browser being refreshed all day, instead of hoping for drive-by referrals from aggregators? Spinewatch: Can Link Journalism Change How the Media Covers the Presidential Election Campaign?